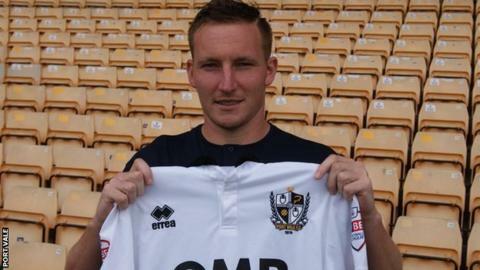 Torquay United have signed Port Vale striker Achille Campion on loan. The 25-year-old Frenchman has agreed a month-long deal with the struggling National League club. "He's shown in training that he's a good player and more important than that he's shown in training that his attitude's what I want it to be," Torquay manager Kevin Nicholson said. "His character is the kind of character I want about the place," Nicholson added to BBC Sport. Campion has been training with the Gulls since last week and has not featured for Port Vale at all this season, but did play in a friendly for Torquay against Willand Rovers on Wednesday evening. "He's got that way about him, he looks like a footballer, he's physically a very good build and very strong," Nicholson added. "I want more from him than what he showed me last night, but I've seen enough in training to show me that he's got that and it's ready to come out."